A Bride On A Budget received this vase for review. All thoughts and opinions belong to A Bride On A Budget. They say that relationships get stale after a while. Who that "they" is remains to be seen, but there is probably truth in that. I mean, be honest: When was the last time your fiance gave you flowers? Now, think about it: When was the last time your dad gave your mom flowers? Who has had a longer gap? If you're lucky and still get flowers on the regular, you're going to want somewhere pretty to display them, like the Reed & Barton Soho Trumpet Vase. 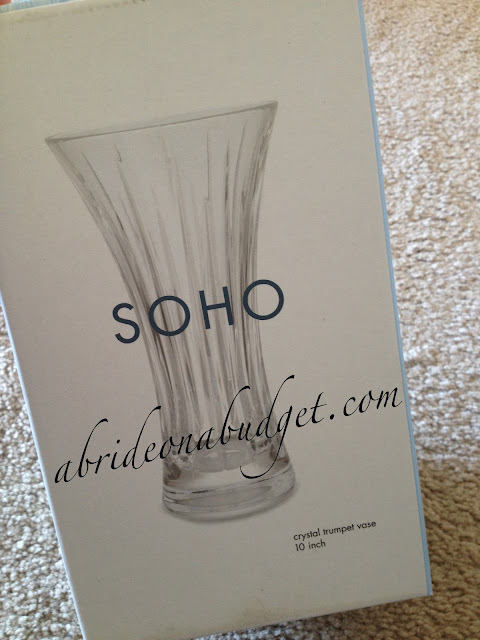 This vase is part of the Soho crystal collection. I was talking about it with my friend who asked what the difference between crystal and glass was. 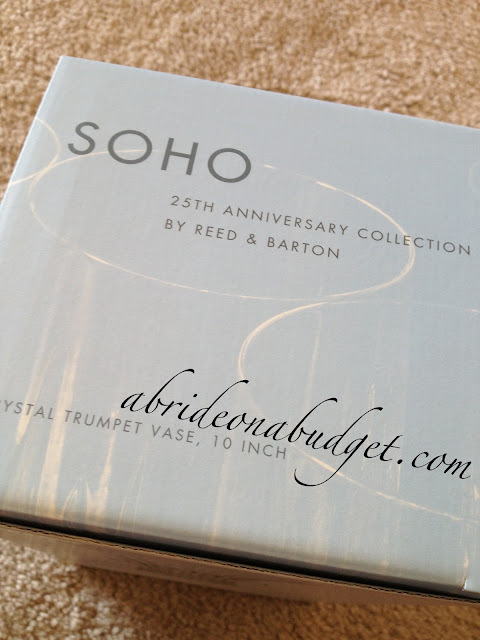 The Soho vase is part of the 25th anniversary collection by Reed & Barton. The brand, if you don't know, makes more than just crystal vases. You can buy flatware, stemware, picture frames, and more. The vase is beautiful. It is flared and made for large arrangements. I really like the shape because it does make flowers easier to display. When vases are completely straight, you lose the shape of the arrangement and you need to know a little more about cutting and placement. With a vase like this, you get a little help in that department. The bottom is solid so I don't worry about the vase getting knocked over (not even by our new kitten who has a tendency to knock over everything). What I really like about the vase is when you look down on it, you get a beautiful star burst. The details on the vase really do stick out. We've actually used this every time we've had flowers since we got it. It's so pretty and every arrangement matches in it, since it's crystal. And it looks as good as it did on Day 1. Part of that is because we treated it before its first use, as stated in the directions. Keep that in mind if you add any crystal to your registry. It has to be treated first, which isn't really a hassle, just a little bit of work. 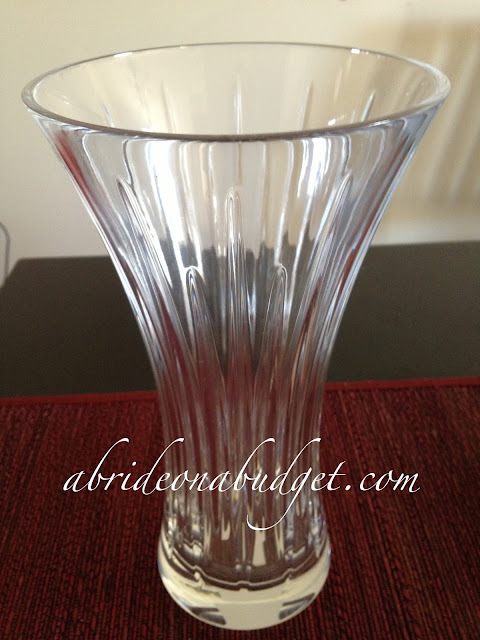 BRIDAL BABBLE: Who would you give this Reed & Barton vase to? Aw, man! I received all of my Reed & Barton flatware (which I love) from Macy's. Had I known about the serveware completion deal at BB&B, I would have registered there instead. I love any type of roses!!! I am so simple when it comes to flowers... I love the babies breathe and daisies! Something about nice, white flowers always gets me! I have a few favorites, depending on my mood and the season, but my top three are rose, tulips, and dendrobium orchids. My favorite type of flower is a stargazer lily. Great review..maybe I should get one for my wife for Valentines Day...hmm. Roses - especially yellow or Peace roses. MY FAVORITE IS ROSES AND LILIES THERE SO PRETTY AND SMELL SO GREAT!!!!!! My favorite flower has to be the lily ... sometimes pink gerbera daisies (depending on whether or not I'm in a "spring" mood) :) Thanks for the chance to win! I would have to go traditional and say roses are my favorite flower. The smell, the look ,everything about them are romantic. I like orchids the most. tulips are my favorite type of flower. i am tony l smoaks on rafflecopter. What can I say? I'm traditional and like roses! I would love to get my mum at least a dozen roses for her birthday next month and this would be a great vase to put them in. Thanks for the giveaway…. we like Gerbera daisies.